Fully equipped Rehearsal Rooms in Southampton. Our rehearsal rooms are designed as professional spaces for bands and artists to work in comfort. Every room is properly sound proofed and acoustically treated, not just to reduce sound getting out but also to make it sound good inside! Our rates are £12 per hour (minimum booking 3 hours) and we are open for sessions 7 days a week. Every rehearsal room comes fully equipped with a high standard of gear. 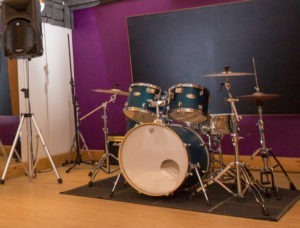 Each rehearsal room is hired complete with PA, vocal mics, drum kit, guitar and bass amps. Designed to allow you to simply ‘plug & play’ – have a look at the individual room pages for the specific gear in each room. Each room also has individually controlled air conditioning and a large comfy sofa!